From the May 2015 Desktop News | What would Dr. John Beeler say to a group of students if it were his last time addressing them? That history matters. He explored this conviction in depth at the 2015 Last Lecture on April 22, for which he was the featured speaker. Lecturers are nominated by students and selected annually by a student committee.  This year, Beeler was selected from among 180 faculty nominees. Beeler said coming up with the topic for the lecture was “as easy as it gets.” In the classroom, especially in classes where non-history majors make up most of the audience, he regularly seizes the opportunity to try to convince his students that an accurate understanding of the past is valuable for wrestling with contemporary dilemmas and, moreover, that history can serve as a crucial source of information as we confront and try to answer confounding questions regarding the future. Preparing the lecture wasn’t nearly as easy, he said. He estimates that he spent 25-30 hours composing it. Read an excerpt from the 2015 Last Lecture below. “Bunk means nonsense, hokum, humbug, etc.,: insincere or foolish talk: nonsense, and is derived from bunkum, which means the same thing. A bit of context is useful here, and in fairness to Henry Ford I should furnish the entire quotation: ‘History is more or less bunk. It’s tradition. We want to live in the present and the only history that is worth a tinker’s damn is the history we make today.’ Now, it should be said that as an historian, Ford made a pretty good industrial capitalist, and he certainly makes a great strawman in this context, but the view he expressed is, I think, common. If history is nothing more than species of fiction, as many have argued: there’s no use in studying it to learn about the past, and even less purpose in writing (or teaching) it. Yet as Cornell West reminds us, the scars and bruises are real. The words on the page of a history book may be products of the author’s imagination, but the events they attempt to depict are, or at least were, real. And if we set our sights more modestly, not to predict the future, as the ‘scientific historians’ of a century and more ago sought to do, or chart the inexorable progress of humanity, as the positivists and others did, we find no shortage of examples of the perils of ignoring the historical record. These are not ‘lessons,’ for history no more teaches us lessons than it ‘repeats itself,’ but they can be regarded as instructive examples. Historical knowledge has other crucial uses too, especially in refuting myths. All of us are historians, in that we all have a conception of the past. It’s one of the central ways in which we make sense of our world. That said, many of us base our understanding of the past more upon myths or fables than on rigorous historical investigation…. A well-informed understanding of the past is the only effectual means to combatting myth. Last, but certainly not least, as Faulkner reminds us, the legacy of the past continues to influence us, in many cases to haunt us. The troubled and tragic legacy of race relations and racism, oppression and exploitation in America (and elsewhere) continues to bear its bitter fruit, as in Ferguson, Missouri, and other recent sites of violence toward African-Americans, and for ongoing racial tensions nationwide, including our own neighborhood. Likewise, the legacy of patriarchy is ongoing, as continuing inequalities between women and men, and the marginalization and victimization of those who fail to conform to normative white male expectations of class, gender, race, or sexual orientation make all too clear. As for the challenge of postmodernism, I am in complete agreement that there is not one monolithic, ‘real’ account of the past, but competing accounts. And while the notion of ‘objective, scientific’ history has been rightly consigned to the dustbin of, well, history, the radical relativism of postmodernism’s verdict on the discipline, that it’s fiction, and that all such fictional accounts are equally valid is, I maintain, just as indefensible. In the absence of scientific certitude we should not plump for the opposite extreme. There is a middle ground, and that middle ground is marked by informed consensus among those with as accurate an understanding of the historical record as is possible. In that manner individual subjectivity can be validated or not by the consensus of experts. So, for all of the perils involved in doing history, it remains vital to our understanding of ourselves and our world, and for helping to inform us as we contemplate the future. The lecture is sponsored by the Graduate School.